Hello, welcome to part three of the series Restoring Old Photo Albums into Pocket Page Scrapbooks. If you've missed either part of this series you can find them here Part One & Part Two. When we left off at part two we had a pile of photos that had come out of the old albums and were ready to be put into brand new pocket page protectors. I wish that I would have counted the number of hours that it took for this entire project. I know it hugely exceeded the time frame I had initially planned. I am, however, so happy that I took this project on and I really appreciate all the help that I got to finish it. A recently I made the trek to visit my grandparents and show them the albums. I should have taken a video of my grandpa's reaction. He was thrilled. I spent a couple of hours sitting at the table with him. We listened to stories he had to tell about the photos that we had put into the albums. I wrote a lot of them down. I can't wait to spend more time with him going through the albums. 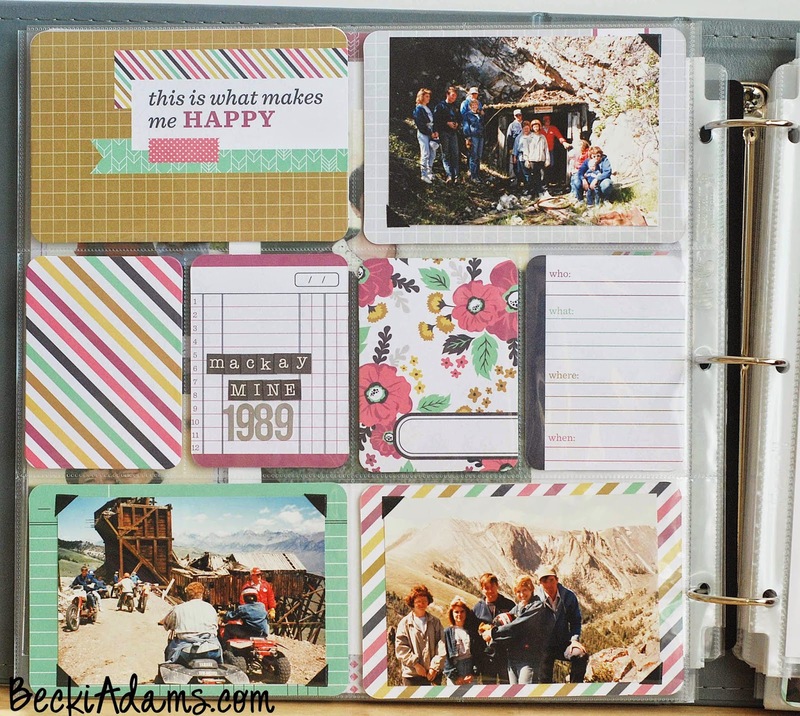 These pages were done with the We R Memory Keepers Farmers Market journaling cards. 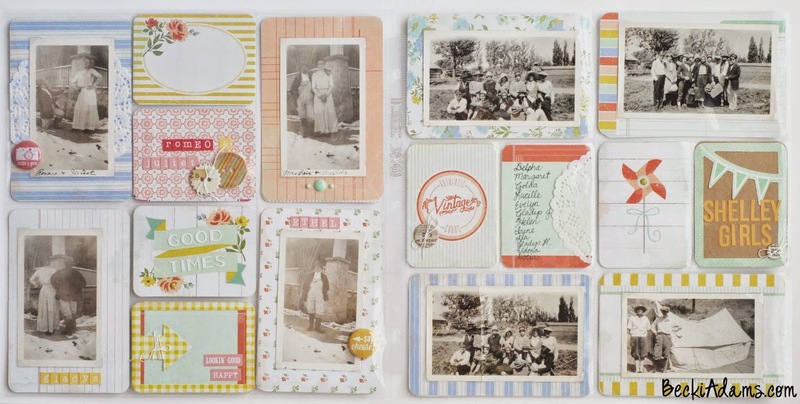 This is the perfect collection if you're doing a vintage or heritage project. The colors are perfect for vintage photos. 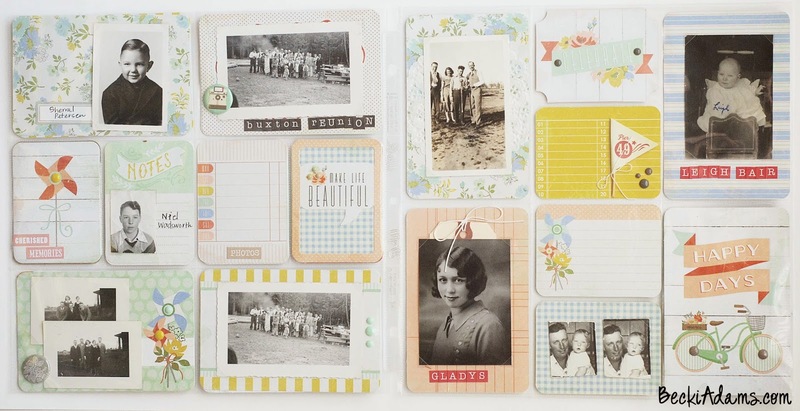 I love that they're made with a soft color palette so that vintage black and white photos stand out. This page was made using the We R Memory Keepers Captured line. I used these cards for the colored photos. I loved how the bold colors complimented the photos that were taken in the 70's and 80's. You'll notice a lot of blank journaling cards. I will fill those out when I can visit more with my grandparents. I'll write their stories on those blank cards. I don't know how to express to you how amazing the We R Memory Keepers Albums are. They are worth every penny. They're absolutely beautiful and their quality is unmatched. These are the only albums I will be buying in the future. When we were finishing up with this project I made a list of things we learned while doing this project. Each photo needs to have a name (first and last) and a date. Nowadays it's especially important for digital files. Name your files with the person's name who is in the photo. We found many photos that had just a first name and so so many that didn't have a date. I don't put a first and last name on every page I create but I do keep them in albums by person (I have an album for each member of my family). Don't write on the photos! Don't write on the front (or the back) of the photo. The ink will most likely bleed and become unreadable. If you really need the information permanently attached to the photo write or type the information on an archival quality label and then adhere the label to the back of the photo. Don't permanently adhere irreplaceable photos. We used hundreds of photos on this project. I wanted to make sure that the photo could be taken out and then replaced if needed. I also wanted to make sure that if there was any information or handwriting on the back of the photos that it could be seen if needed. Use archival quality products as much as possible. Nowadays most products are archival quality. You'll see a lot of them that say "acid free" those are the products you want to use. The old "magnetic" albums from the 80's are the ones that have glue that are made with acid. That's what was ruining my photos. You do need to be careful with some of the embellishments that are popular today. Wood veneer and cork are not archival quality and shouldn't ever touch your photos. Write your stories down! Write your own stories down, even if there are not photos to go with the stories. My grandparents told so many stories that didn't have photos. The memories were sparked by a photo they saw in the albums. Thank you for following along with this series. I hope that somewhere along the way you're inspired to take care of some of your old photos. What a great project of restoration! Specially the opportunity to talk to your grandpa and recover all the stories...lovely! 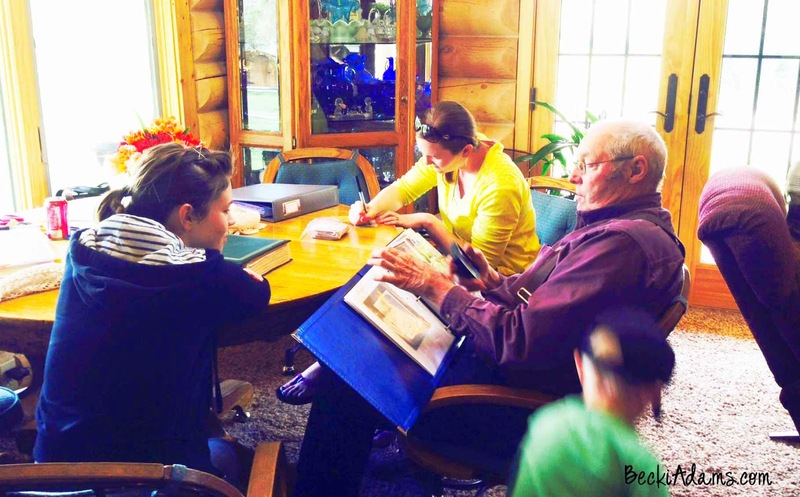 Yes, Bi, my favorite part of the project was visiting with my grandpa about his old photos. I hope to get to do it again soon!!! What a wonderful project! I have really enjoyed this series! I need to get to work on my parents old photos! Yes, Miriam, do work on your parents photos. It's a lot of work but so very rewarding. Lovely project! 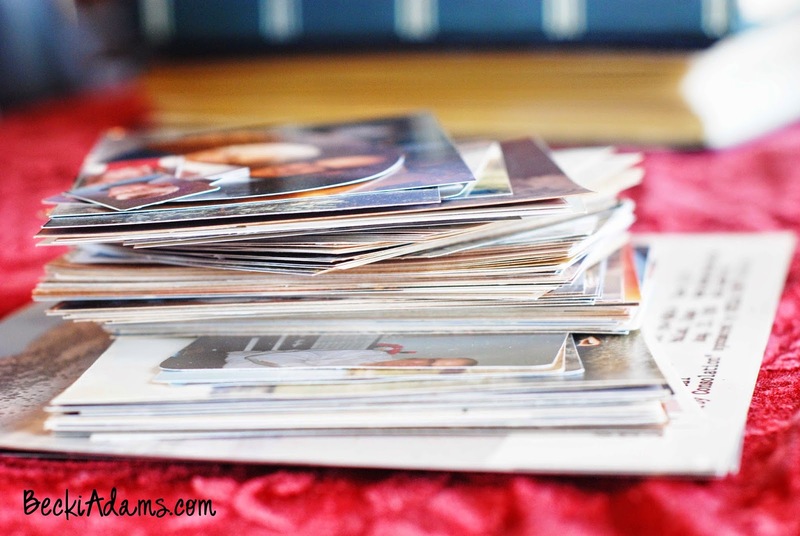 I reunited the old pictures of my family in albums but was a little stuck about what to do next, this gave me so many ideas! Thanks for sharing! Nanda, I'm thrilled that you got some ideas! Thanks for stopping by! Your PL spreads look amazing! Those old photos are fabulous! Nice job! Thanks Debbie! I'm so glad you like them! just amazing. 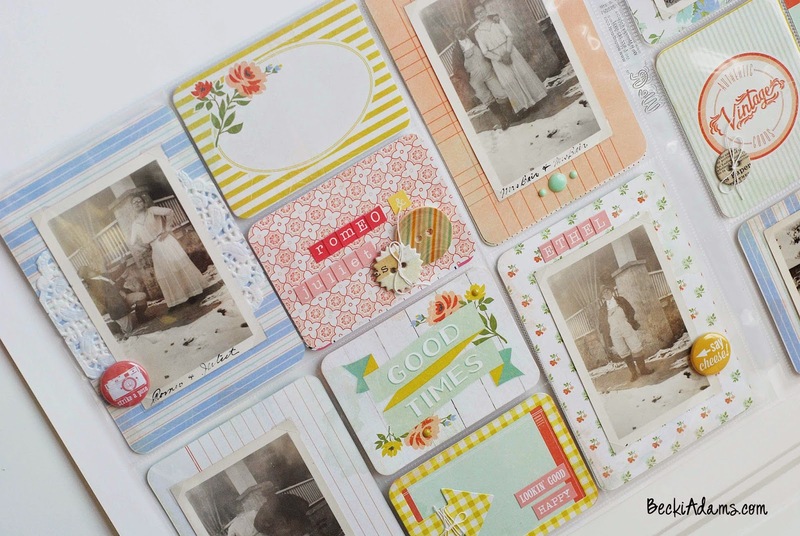 i LOVE how you incorporated the oldies into the new pretties. it gives the new stuff a very elegant flair! Aww, thatnks Leah! I love the combo of the old photos with the new product too! Such a great match! How do you get the sticker off the front of their albums?? Goo gone ruins mine. I saw this over at SCT and had to come to see more "up close and personal" :-) What an amazing solution for the old photos. I have several of my mom's "ancient" photo albums. The pages just crumble. This is a perfect solution for those precious pictures. Thank you for sharing! Thank you! I appreciate your sweet comments so much! Thanks for stopping by. WOW.....I have been wondering what to do about my partners "old" albums that are in very poor condition, and you have just "answered" my questions.......so thank you for all your great work and sharing it. I bought some of these divided pages ages ago for "next to scrap photo storage" but now have a better idea on what to use them for. Will have to get started as I would like to surprise him with a "new" album of his old family photos for Christmas......once again thank you for sharing! Thank you Carmey! I hope you've started your project and that it's going well. It's a huge task to take on but it's worth it! Wow! I'm so lucky to have come across your postings. This series is inspiring! 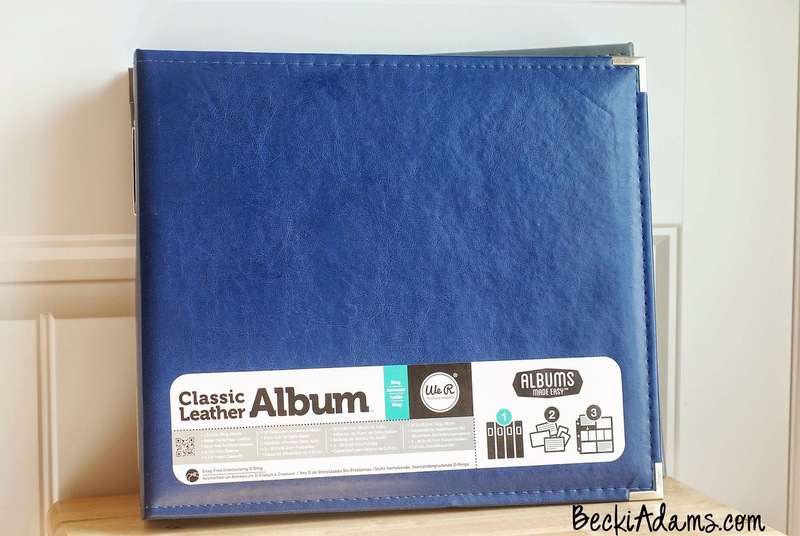 I've wanted to start a similar project but have been hesitant because the Photo Pockets are not the sizes of the old photos. How did you get them to stay in place in the pockets? As you say, I don't want to adhere them permanently or damage these family heirlooms in any way. Archival quality is important to me. Did you use some sort of adhesive or are the photos just wedged in the pockets? The pages are just gorgeous! Thank you for any advice you can offer! Thank you Cartherine! Your comment is so sweet. Great question. I share your same hesitation with adhesive. I used photo corners to adhere the photos to the cards before I slipped them into the pocket. I hope that answers your questions. Please let me know if I can offer you any further help. Have a wonderful day! Thanks, Becki. I never thought of doing it that way--it solves my dilemma. What a great idea! Thanks Becki, inspiring me to tackle those old albums now! I'm so glad to hear that Susan! What a wonderful compliment. Thank you! I too have dozens of old albums that need to find a new and safer home. I've hesitated to start because I am not sure which design of page protectors to use. There are SO MANY to choose from -- do you have any tips about that? I guess I just need to get started and I'll figure it out along the way! I am so excited to have found you at this time. I am the "bucket" for all of the family photos for the last 3 generations. My dad was a photographer and he took wonderful care of my paternal side's photos. Truly, I do have boxes and tubs of photos to take care of. I need to do it before I can't remember who the people are. I have already bought most of the supplies you recommend, but just didn't know quite what to do. If you do have to write anything on the back of a photo, use a stabilo pencil. I just ordered mine from Amazon.